First of all, I want to congratulate Sound Theatre Company for its recent and well-deserved Gregory nomination in the “Best Theatre” category. I have sung the praises of Teresa Thuman and her cohorts at STC many times in my past reviews, and I am so happy to finally see them get the recognition they deserve. The company always chooses challenging and substantive works to perform, and normally executes them with a high level of artistry and professionalism (AND, I might add, on a budget that is MUCH SMALLER than those of the bigger and better known houses in town!). They are slowly but surely becoming a force with which to be reckoned in the Seattle theatre community, and they deserve all the love that is being thrown their way by the Gregory’s! Although the inspiration was certainly there, the show fell sort of flat for two primary reasons: a relatively weak cast combined with a directorial unwillingness to truly embrace the contemporaneity of Ives’ work. Unfortunately, this resulted in turning what should be a raucous and bawdy farce into a relatively bland light comedy. But to be fair, perhaps some of the fault lies with the playwright himself, who decided to use contemporary American English (written in verse), but kept the play set in Paris of 1666. In any case, the show came across as a very traditional production of a Molière play with a few allusions to modernity thrown in for good measure; but I felt like it should have been just the opposite: a very modern production with a few allusions to 17th century France thrown in instead. The show takes place in one of the wittiest salons in Paris, that of Celimène, (played by Page Byers), a widow who is being sued for her slanderous portraits of well-to-do Parisians. Since her husband’s death, she has been profiting from the attention of three bumbling suitors: Oronte, Clitander, and Acaste (played respectively by Dylan Smith, Paul Barrois, and Corey Spruill). However, Celimène’s world changes quickly when an acerbic, quick-witted misanthrope from England named Frank (played by Frank Lawler) strolls into town. Soon, love and lies abound in Celimène’s household, and everyone gets in on the action. Rounding out the cast is Philinte (played by Matthew Gilber), Eliante (played by Marianna DeFazio), Arsinoé (played by Alysha Curry), and Dubois/Basque (played by Henry James Walker. Although the two leads, Celimène and Frank, do a suitable job in their roles, they just don’t quite manage to truly deliver the sauciness and quick-paced physicality required. And the same goes for the rest of the cast with the exception of DeFazio and Walker. Indeed, it was these two secondary characters, Eliante and Dubois/Basque, who brought most of the laughs from the audience. They each took what few scenes they had and made them the most memorable moments of the show, while the rest of the cast remained rather unexciting, giving merely standard performances. And this leads to my second issue with the show: the unwillingness to truly embrace the modernity of the text. Aside from a few cell-phones being thrown in and some entertaining portraits being sung in contemporary style, the show missed the mark in terms of seeming to be contemporary. Although the costumes by Linnaea Boone Wilson were quite beautiful to look at, they were still too rooted in 17th century garb and lacking in contemporary style. With their bright pastel colors, bold wigs, and exaggerated accessories, the costumes were more like a mixture of circus clown clothing and traditional dress, complete with long petticoats and wigs. I would have liked to see a more sleek, modern costume design set against a more classical and traditional set design. And the same goes for the sound design (by Joshua Blaisdell) and set design (by Suzi Tucker) as well. 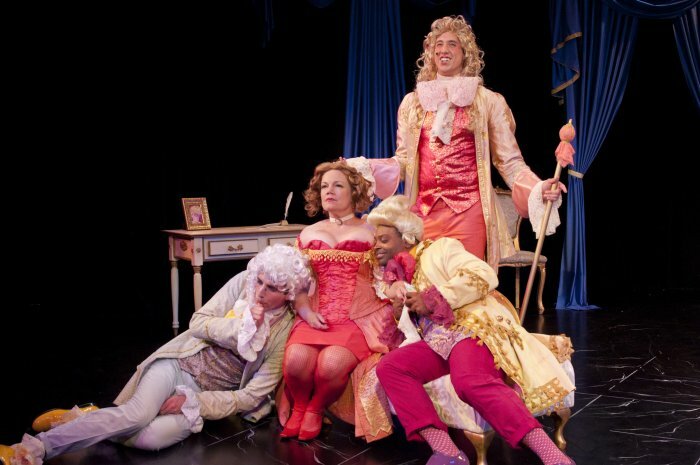 Molière’s plays were historically full of music, but I felt that there was a serious lack of sound in the play; and the original music (by Jesse Smith) was also lackluster. It wasn’t fun or pulsating, but rather somewhat tired and unenthused instead. And the set could have benefitted from projections, especially during the “portraits” scenes that were performed to music and dance. There was just a level of spectacle that was lacking overall, which was unfortunate, because this play needed flash! Again, much of this could be the playwright’s fault; but in my opinion, things were done in reverse order of what they should have been. I wanted to see a modern Molière with allusions to the past. Spare me the over-the-top wigs, the tights and petticoats, and the long flowing dresses! I want some gaudy high fashion, some De La Croix “dahling!”, some Givenchy, Gaultier, Hermès, and Yves Saint Laurent! To be clear, I do NOT think this was a bad show. In fact, as things went along, it did become more engaging. However, knowing the high caliber of work usually done by STC, I felt that this one fell short.